Located on an island just offshore from Biddeford Pool, Maine, Wood Island Lighthouse is a unique Maine island lighthouse experience. 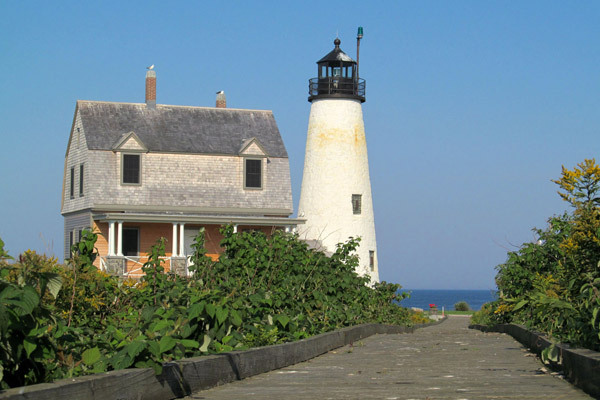 The Friends of Wood Island Lighthouse, a chapter of the American Lighthouse Foundation, offers special tours during July and August (Wednesdays, Thursdays and Saturdays) of the light tower and keeper’s house. Transportation is provided. Your trip begins as you embark LightRunner at Vines Landing in Biddeford Pool for a 15-min trip to the island. Upon arrival at the island, your volunteer host will welcome you and share what life was like for a keeper on this island station. You will then take a beautiful half-mile walk along the elevated wooden boardwalk to the lighthouse itself. Visitors have the opportunity to tour the keeper’s house, climb the tower, explore the grounds and take photos. Click here for more details and to make a reservation. There is no charge for the tour, but donations are greatly appreciated! All proceeds help us to continue caring for this historic site and providing opportunities for you to enjoy this special place. Please note: The guided tour takes about 1 1/2 hours and is subject to Mother Nature and her weather and sea conditions. Children must be 12 years or older to climb the tower and must be accompanied by an adult.